The Multi-Gauge (MG) range of vacuum ion gauge controllers offer a wide range of options for vacuum measurement depending on vacuum gauge types and number of vacuum gauges. They are packed with industry leading features and are compatible with all third party gauges currently on the market. 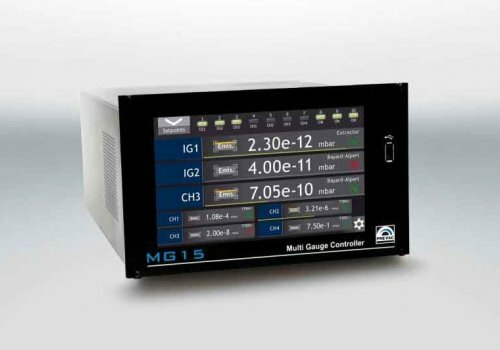 The MG vacuum ion gauge controller range includes the MG13 dual gauge controller (1x analogue gauge & 1x ion gauge) and the MG15 multi ion controller which can support up to 4x analogue gauges and 3x ion gauges in a single unit and features a large colour charts/trend view module. All models also support PC control with dedicated software options and feature a wide range of digital and analogue I/O facilities.